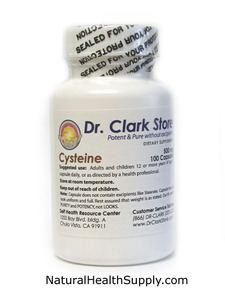 Each of the 100 gelatin capsule contains 500 mg of L-Cysteine, guaranteed pure and potent from the Self Health Resource Center. No binders, no coatings, no dye, no excipients such as Stearate. Capsules may not look uniform and full. Rest assured that the weight is as stated. Suggested Use: Adults and children 12 or more years of age, 1 capsules daily or as directed by a health professional.